The Health Education & Research Centre (HERC) at the Australian Nursing and Midwifery Federation (Tasmanian Branch) is seeking a highly motivated individual to be responsible for the effective day to day management of all general administrative duties associated with students, internal and external stakeholders. Enjoy the challenge and reward of an exciting position as part of the HERC Team. • Commitment to the principles of Unionism. 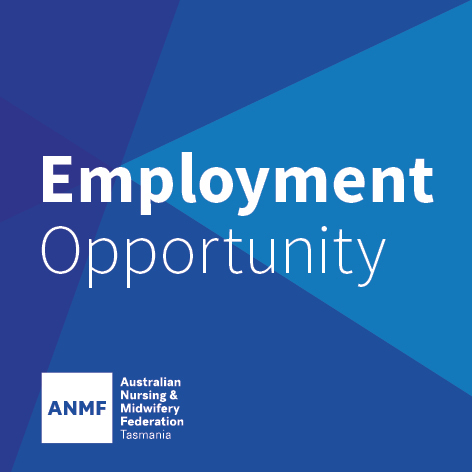 For further information please contact HERC Business Manager, Siobhan Grady, jobs@anmftas.org.au or (03) 6223 6777.
or via email jobs@anmftas.org.au by COB 1 May 2019. ANMF/HERC will contact candidates who may progress to interview and if your application is unsuccessful you may not be contacted. ANMF (Tasmanian Branch) is an equal opportunity employer.